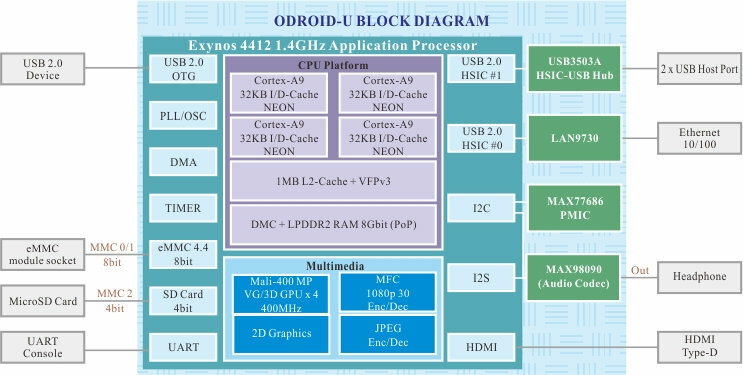 Hardkernel has just announced 2 tiny quad core development boards based on Exynos 4412 @ 1.4 GHz (as used in Samsung Galaxy S3) and Exynos 4412 Prime @ 1.7 GHz (as used in Samsung Galaxy Note 2) called respectively ODROID-U and ODROID-U2. The other difference is the U version comes with 1 GB RAM, and the U2 version with 2 GB RAM. Processor – Samsung Exynos4412 @ 1.4 GHz (ODROID-U) or Exynos 4412 Prime @ 1.7 Ghz (ODROID-U2), which can be overclocked respectively to 1.8 GHz and 2 GHz. GPU – Mali-400 clocked at 400MHz (ODROID-U) or 440MHz (ODROID-U2), which can be overclocked respectively to 533 and 633 MHz. As with the ODROID-X, Hardkernel will provide Android Jelly Bean and Ubuntu images and source code. Schematics will also be made available but only on the 31st of January 2013. As you can see from the picture above, ODROID-U(2) boards will be shipped with an aluminum heatsink that will also serve as a case for the board. Most of ODROID-X modules (See unboxing) will be available for the platforms excluding LCD screen and Camera module which are not available for the new platform. Watch the video below for a tour of the board, accessories and see what you can do in Ubuntu (web browsing in Firefox, printing in Libreoffice…). Hardkernel also announced further details about ODROID-X2 board (same as ODROID-X board but with Exynos 4412 prime and 2 GB RAM) that will be sold for $135 (instead of $149 previously announced) and be available on the 10th of December 2012.